The southwestern Bulgarian town of Sapareva Banya has completed the construction of its new museum of history, archaeology and ethnography which will be used to showcase its heritage from the Ancient Thracian, Roman, Early Byzantine, and medieval Bulgarian city of Germania (Germaneia). The construction of the new museum in Bulgaria’s Sapareva Banya has been completed in time, and the official opening will be held as planned – in mid October 2015, reports the Bulgarian National Radio. 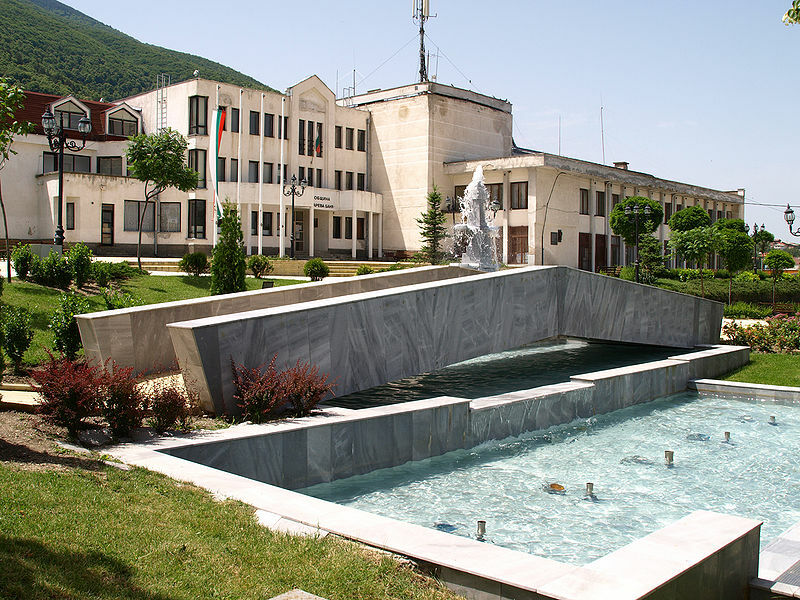 The new building has been inspected by Sapareva Banya Mayor Sasho Ivanov and representatives of the Regional Museum of History in the western Bulgarian town of Kyustendil (the town of Sapareva Banya in is the District of Kyustendil). The exhibition space on the two floors is to present the latest archaeological discoveries from the ancient and medieval city of Germania (Germaneia). These include a replica of the gold coin of Eastern Roman (Byzantine) Emperor Theodosius II (r. 408-450 AD) which was discovered during the rescue archaeological excavations of an Ancient Roman villa near the ruins of Germania in the summer of 2015. A total of 25 other 25 bronze coins from the 2nd, 5th, and 6th century AD as well as a number of other artifacts found in the Roman villa will be also showcased in the future Sapareva Banya Museum of History. In addition to the archaeological exposition, the future museum in Sapareva Banya, a small but famous spa resort in Southwest Bulgaria whose permanent population of about 4,000 usually triples during the summer season, will also feature an ethnographic collection. The ethnographic items are present on display in Sapareva Banya’s chitalishte, as the specific institution of a Bulgarian cultural community club is called. 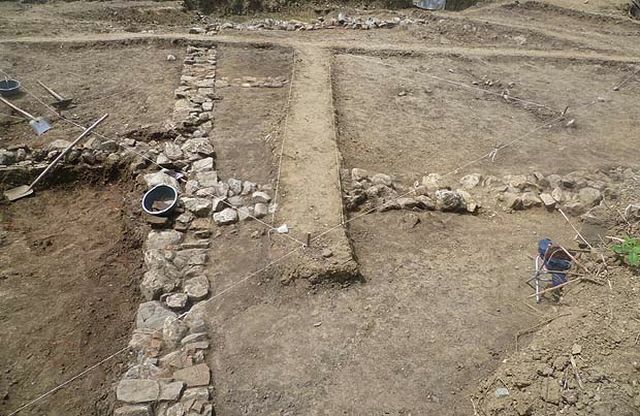 Among the other intriguing discoveries in the Roman villa found during the construction of a swimming pool over the summer have been the graves of a child and an adult man probably killed in a barbarian invasion of Attila the Hun. The villa belonged to a wealthy Roman landlord, which is also testified by two perfectly preserved pipelines, a fountain, a baking oven, and an ancient Jacuzzi. The heating system of the Roman villa is described as “amazing": it consisted of pipes located in a 20-cm space between the stone masonry and the outer ceramic tile wall. The pipes were filled up with warm vapor from the hot mineral water springs, which heated the entire villa. The 3rd-4th century AD Roman villa extra muros, i.e. located outside the walls of the ancient city of Germania was probably burned down precisely during the punitive invasion of Attila the Hun in the Balkan provinces of the Eastern Roman Empire (Byzantium) in 447 AD. It was staged after Emperor Theodosius II refused to pay Attila the required annual tribute of 6,000 Roman pounds of gold. The Hun invasion destroyed a lot of Late Roman and Early Byzantine cities, including Germania. The archaeologists hypothesize that the inhabitants of the Roman villa were probably surprised by the attack of the Attila the Hun’s hordes, and tried to flee the place with their most valuable belongings. In 447 AD, the invading Huns went on a rampage in the Balkan provinces of the Eastern Roman Empire, i.e. Byzantium. In his work “Life of St. Hypatius", chronicler Callinicus of Rufinianae writes that the Huns captured over 100 cities in the region of Thrace and almost threatened the imperial capital Constantinople. The ruins of the Ancient Thracian, Roman and Early Byzantine city of Germania (also known as Germane or Germaneia) lie underneath today’s southwestern Bulgarian town of Sapareva Banya. The name Germania stems from the Thracian language, and is believed to mean “hot springs". Another interpretation claims that it stems from the name of a Thracian deity of warmth called German. Ever since prehistoric times, the city of Germania (Sapareva Banya) has been known as a spa resort because of its mineral springs. It is located at the foot of the Rila Mountain, the tallest mountain in the Balkans (whose Mount Musala towers at 2,925 meters), on the left bank of the Valyavitsa River, which flows into the Dzherman (German) River (the latter has preserved its Thracian name to this day). Germania’s history of civilized life starts with an Early and Mid-Neolithic settlement located in an area known as Kremenik, which was inhabited by members of one of Europe’s earliest civilizations. Germania emerged as a major Roman civilian settlement in the 3rd-4th century AD. Based on Roman inscriptions, it is believed that the Roman city grew out of a Roman military camp on the site of a Thracian settlement, most probably the camp of the 500-strong Cohors II Lucensium. The earliest testimony about the stationing of the Roman cohort Cohors II Lucensium on the territory of today’s Bulgaria is a Roman military diploma from January 7, 78 AD, found in the Roman city of Montanesium, today’s Montana in Northwest Bulgaria. It is also known that it was stationed in Abritus (today’s Razgrad in Northeast Bulgaria), and later, in 136 AD, in Kabile, one of the Ancient Thracians capitals, located near today’s Bulgarian city of Yambol. It is believed that Cohors II Lucensium was stationed at Germania in 198-199 AD, and remained there at least until 222 AD, and possibly until the reign of Roman Emperor Gordian III (r. 238-244 AD). There are no written sources indicating that another Roman military unit was stationed at Germania after Cohors II Lucensium. The first fortress wall of Germania was most likely constructed at the of the 2nd century AD, during the reign of Roman Emperor Septimius Severus (r. 193-211 AD). In the 5th century AD, the city of Germania was severely damaged by barbarian invasions, most notably, the invasion of the Huns led by Attila in the middle of the century. During the reign of Byzantine Emperor Justianian I the Great (r. 527-565 AD) the fortifications of Germania were rebuilt, and a second fortress wall was added to widen the first for a combined width of 3.5 meters. 6th century AD Byzantine chronicler Procopius of Caesarea (ca. 500-ca. 560 AD) mentions in his works that when Emperor Justinian saw that the fortress walls of Germania (today’s Sapareva Banya), Serdica (today’s Sofia), and Pautalia (today’s Kyustendil) had been destroyed, he decided to restore them, and make them “invincible for the enemies". In addition, he rebuilt one fort and erected six others outside Germania to help protect the city. The fact that Procopius mentioned Germania together with major Roman and Byzantine cities such as Serdica and Pautalia testifies for its importance. In his 527-528 AD work Synecdemus (Synekdemos), 6th century Byzantine geographer Hierocles mentioned Germania as one of the five cities in the Roman province of Dacia Mediterranea. (In 271 AD, Roman Emperor Aurelian (r. 270-275 AD) transformed the province of Moesia Superior into the province of Dacia Aureliana with its capital at Serdica (today’s Sofia), after vacating Dacia Traiana beyond the Danube. Around 283 AD, Dacia Aureliana was divided into two provinces, Dacia Mediterranea, with its capital at Serdica, and Dacia Ripensis (“Dacia from the banks of the Danube") with its capital at Ratiaria (Colonia Ulpia Ratiaria).) Germania was the birthplace of a Thracian man named Belisarius (ca. 505 – 565 AD) who became one of Emperor Justianian’s most talented generals helping him reconquer for Byzantium, i.e. the Eastern Roman Empire, much of the Western Mediterranean and the Western Roman Empire; he is often mentioned as one of the “Last of the Romans" (i.e. the individuals who embodied the values of the Roman Empire at its best). The flourishing Roman and Byzantine city of Germania was destroyed once again in the barbarian invasions of the Slavs and Avars at the end of the 6th century AD. The latest evidence from the Early Byzantine Empire is a coin of Byzantine Emperor Phocas (r. 602-610 AD). After the 7th-8th century AD, Germania became part of the First Bulgarian Empire (632/680-1018 AD), and as such it was often the arena of battles in the Bulgarian-Byzantine Wars during the entire period of the Middle Ages. It developed as a strategically important medieval Bulgarian city near the city of Velbazhd (Pautalia in Roman times, today’s Kyustendil). The life of Germania during the First Bulgarian Empire is evidenced by the discovery of large amounts of pottery dating from the 7th-11th century AD. The city of Germania is mentioned in a 1019 AD chrysobull, i.e. a golden bull, of Byzantine Emperor Basil II the Bulgar-slayer (r. 976-1025 AD) who eventually defeated the First Bulgarian Empire in 1018 AD. In it, Basil II confirmed the Bulgarian bishoprics the same rights granted to them by the Bulgarian Tsars Petar I (r. 927-969 AD) and Samuil (r. 977/997-1014 AD). The city of Germania became part of the Second Bulgarian Empire in 1205 AD when it was conquered by Bulgarian Tsar Kaloyan (r. 1197-1207 AD). The last medieval source to mention the city of Germania (today’s Sapareva Banya in Southwest Bulgaria) is the work of 12th century Arab geographer and traveler Muhammad Al-Idrisi (1099–1165 or 1166) who described as a beautiful city surrounded by vineyards and cultivated fields. At the end of the 14th century Germania was the site of horrific battles between the invading Ottoman Turks and the resisting Bulgarian forces. Its modern-day name of Banya (meaning “bath") was first mentioned during the Ottoman period, in 1576 AD. The town became known as Sapareva Banya only in the second half of the 20th century when it was merged with a nearby town called Saparevo. The ruins of the Ancient Thracian, Roman, Early Byzantine, and medieval Bulgarian city of Germania were first discovered and excavated during rescue excavations in 1951-1961 by Bulgarian archaeologist Teofil Ivanov. Additional archaeological excavations were carried out in 1977-1981. Unfortunately, most of the ruins of Germania remain underneath the spa center constructed in Sapareva Banya during the communist period. What can be seen today are the ruins of its eastern gate, and some wall ruins in the basement of the spa center. One of the most interesting historical and cultural monuments of Sapareva Banya is the medieval cross-dome church St. Nikola (St. Nicholas) which dates to the 12th-13th century AD when Germania was part of the Second Bulgarian Empire. Important historical landmarks are also the 18th century church St. George and the Holy Forty Martyrs Church from 1859, both of which are from Bulgaria’s National Revival period (18th-19th century) which led to Bulgaria’s National Liberation in 1878. Great background notes – thanks!